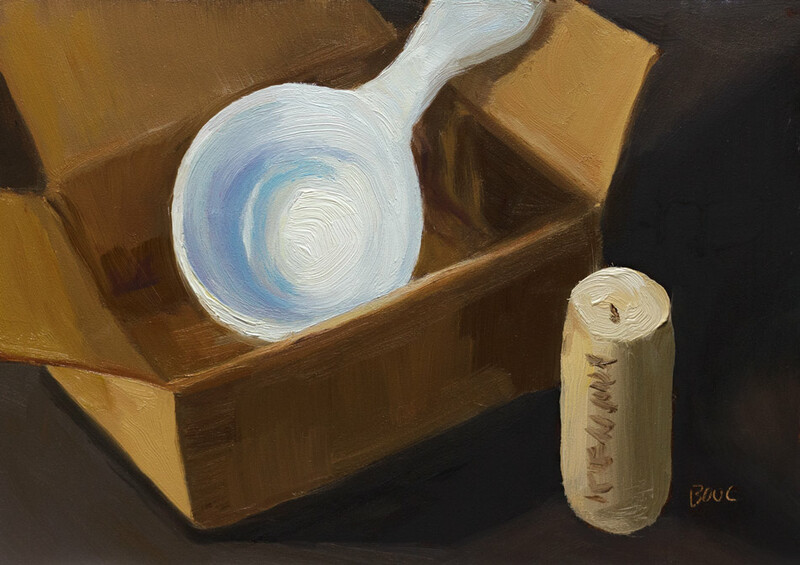 Scoop and Cork, oil on panel, 5x7"
Peet’s Coffee is selling coffee scoops in three sizes that measure exactly the right amount of coffee for their French press coffee makers. Although I was happy with my French press pot and coffee scoop, I couldn’t resist the promise of the perfect cup of coffee. Haha. It holds exactly the same amount that I already use. And it’s too wide to dump the coffee into my little French press pot without some of it landing on the counter and the handle is too short to comfortably scoop out of the bag or canister. So, while useless in the kitchen it is earning its keep as a model in the studio. 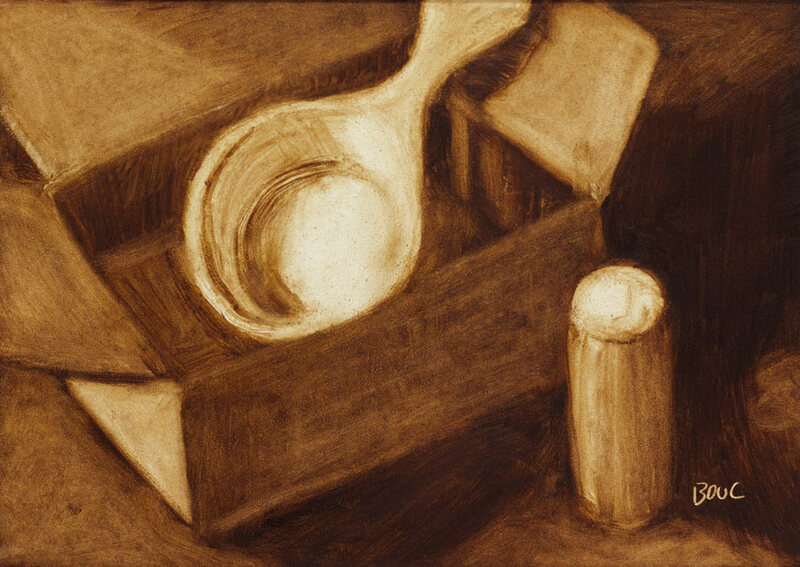 Value study/under-painting for Scoop and Cork, oil, 5x7"
This week’s Daily Paintworks challenge is to do a value study using only burnt umber, and to vary the amount of dark, medium and light so that there is a majority of one, some of the other, and a smidgen of the other. This is done by applying a thin layer of burnt umber, wiping it down for mid value, painting in the darks using only burnt umber, and wiping with paper towel or q-tips dipped in mineral spirits for the highlights. I was going for a majority of dark, some middle, and smidgen of light. Not sure if I accomplished that. It seems like there’s almost as much middle as there is dark. I’ve done plenty of value studies and monochrome paintings, but I’d never done it this way before and enjoyed it. I like the way the finished study kind of glows but used it as a the under-painting for the painting at the top of this post. The white scoop has a beautiful moonlight-like gleam so I guess it has made amends for its less than useful status as a kitchen implement. So the apples and the coffee scoop are kind of pals now! Each group having found new lives in art after failing at their other once destined roles! Well, all’s well that ends well. Right!